Read the up to date information about the pearl of USA, Miami, to find about the city's best dining, shopping, drinking and sightseeing spots. When you first land in Miami you are immediately taken in by the beautiful warm weather, the palm trees and the salty smell of the Atlantic Ocean that wafts on the breeze. This cool, decidedly sophisticated city is a wonderful place to visit, as it offers a tropical vibe without ever leaving the country. Miami is a large, vibrant and colorful city, in both the visual sense and the many diverse personalities that call this southern city home. Miami is a large, sprawling metropolis that has a wide variety of neighborhoods, each with their own ethnic flavor. Cuba is represented well in this city and the sounds and flavors of that country can be found on almost every corner. People come from all over the world to experience the wacky yet sophisticated essence that is found in South Beach. It is no wonder the rich and famous all seem to have vacation homes here, adding to Miami’s glamour and allure. The city has music that comes from every pore of the sidewalk. The rhythmic lull of the ocean waves, the dull roar of traffic cruising up and down Ocean Avenue and the festive pastel colored homes and businesses add to the melody that is Miami. One visit here makes many people consider leaving it all behind and staying in this vibrant, colorful city for good. 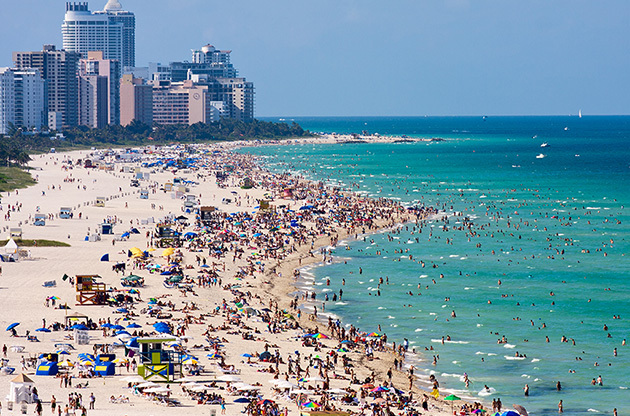 Miami is located on the southeastern tip of Florida, snugly sitting on the Atlantic Ocean. Most travelers will arrive in the city at Miami International Airport. This large and busy airport is eight miles south of the downtown area. Once off the plane, visitors can travel to their hotels via any number of busses or taxis. The city also offers a variety of private car services to take you to your destination for a nominal fee. Miami offers a wealth of attractions that are as diverse as the city itself. Museum lovers must visit Vizcaya Museum and Gardens. This indoor/outdoor museum boasts beautiful art and pristine, well-maintained gardens depicting the lush fauna of south Florida. For an experience that will be enjoyed by young and old alike, the Miami Children’s Museum is the place to go. Featuring interactive displays and exhibits, young people – and the young at heart – will have a wonderful time exploring, discovering and learning. And for a decidedly different museum experience, The Gold Coast Railroad Museum offers the history of trains in the coastal areas. This fascinating museum draws thousands of visitors each year to learn about the development of the railroad industry and its impact on the lives and commerce of Floridians. Miami’s gorgeous tropical weather simply begs one to spend as much time outdoors as possible, and the city has answered this siren call by providing a plethora of outdoor entertainment options. The city has numerous parks, walking, jogging and biking trails, inline skating parks, skateboarding parks and of course, miles of sandy white beaches. While splashing in the waves rent a Jet Ski or water bike and take to the waves in a whole different way. For adventurers, Mark the Shark provides half or full day excursions into deep ocean waters to teach his passengers all about bringing in the big game of the sea – deep water sharks. Hammerheads, great whites and many other types of sharks have been caught by professional and novice fishers alike. Miami is a city that makes music in its own, unique way. The proof of this is in the wide variety of performing arts venues that Miami houses. For a night at the theater with a decidedly Latin flavor, you must see a performance and admire the art at Centro Cultural Espanol en Miami. This south of the border troupe of actors, musicians and performers bring the city’s Hispanic roots to the forefront, and also features galleries of artwork by many of the most important Latino artists of yesterday and today. Fans of the opera will have to visit the Florida Grand Opera. This company has been performing the most dramatic works for many years, and some of the greats of opera have performed on this stage. Shopping lovers will consider a day of shopping in Miami a day of paradise. There are many stores, malls and boutiques all over the city. Start the day at Aventura Mall and you may never leave. With over 300 department, specialty and designer shops, there is literally something for everyone on your shopping list under one roof. For a different shopping experience, and of course for the cigar aficionado, one must check out Little Havana Cigar Factory. Watch how real Cuban cigars – though these are legal in the States – are made, and then sample one as part of the tour. And while in Little Havana check out the many bodegas and other shops that abound in this thriving Cuban neighborhood. Dining in Miami is an epicurean delight. For lovers of sushi and other fine seafood, a visit to Tatu is a must. This trendy eatery is populated by celebrities, hipsters, local foodies and tourists alike. It offers the best and the freshest sushi in town in an atmosphere that is decidedly cool, yet understated. Toro Toro Restaurant and Bar is a tapas bar and steakhouse all rolled into one. This amazing restaurant captures the flavors of Spain in a gorgeous setting. Make reservations so you don’t miss out on trying this amazing restaurant. An after dinner palate cleanser can be found at Azucar Ice Cream. This funky ice cream parlor serves up the usual fare alongside some exotic and wild concoctions. For ice cream like you’ve never experienced before, Azucar is the place to go. Miami nightlife is unlike any other place in the world. South Beach alone teems with dance clubs, nightclubs, bars and other hot spots that draw visitors like flies. Twist is the hottest dance club in Miami. With a pounding beat and great DJs spinning the latest dance music, this club offers a huge dance floor and ample seating for relaxing with a drink before going back out on the floor. Another favorite spot of locals is Tobacco Road. This iconic bar has some of the best blues and jazz performers in the world playing on its tiny stage. The drinks are reasonably priced too! Miami Everglades Airboat Adventure takes you through the Everglades on an airboat. See the local wildlife up close and personal – alligators, anyone? The tour guides are friendly, knowledgeable and will introduce you to the wild world of the swampland known as the Everglades National Park. Or take a two-wheeled tour of Miami on a Segway. These tours allow you to explore the South Beach area in a relaxed manner while having fun. Segway tours are great for families with older children as well. Miami welcomes a large number of event attendees who visit city in the aim of partcipating in their desired congress, conference, symposium, exhibition, trade show or fair. Thanks to the expertise of the organizers and the quality of hotels and venues, they always leave the city with an intention to come back again.